On July 27, the San Diego Military Family Collaborative introduced the topic of the month on Back-to-School Resources. Over 70 military providers, agencies, and individuals gathered to learn valuable information on returning to school and seeking higher education, and what it means to work in this area and the unique issues and trends that are seen in the community. Our guest presenters and panel represented Homeschooling, Military OneSource, Marine Corps Air Station Miramar, San Diego Public Library, and the Exceptional Family Resource Center. Thank you to our panelists for sharing their knowledge and expertise! 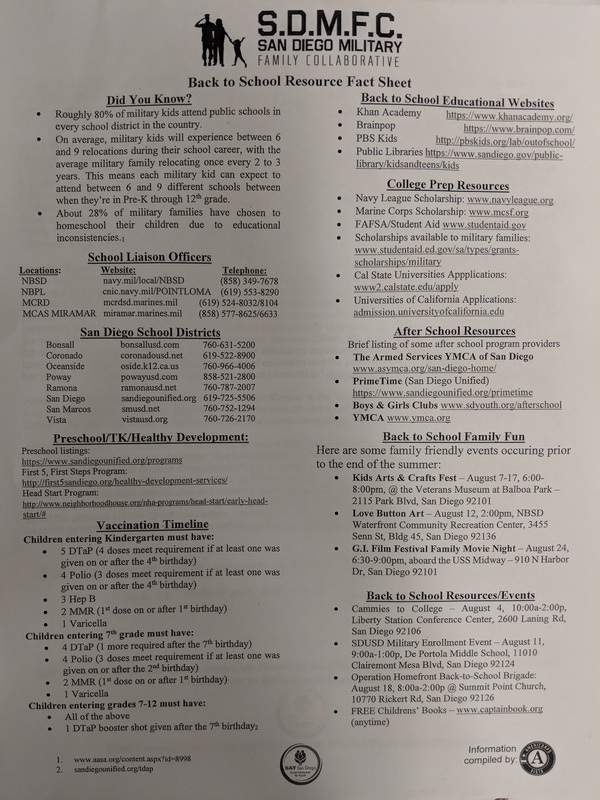 SDMFC also provided a Fact Sheet loaded with helpful information, including contacts for School Liaison Officers, a list of San Diego school districts, and college preparation websites, among other things. Check out our fact sheet below or download it! SDMFC Monthly Convenings are every 4th Friday of the month, 10:00am – 12:00pm @ Mission Valley Library. Join us on August 24th for our next one on Employment! Please see below if you would like to watch the panel on Facebook LIVE or to read our panelist bios. Post By: Derek Armstrong. Derek is an AmeriCorps VISTA for the San Diego Military Family Collaborative. He is proud to serve those who have served.